In the following weeks, thank you notes would begin to arrive. Some were quickly dashed off. "Thank you for the gift. It will be very useful in the future." I'm sure you have received similar notes written more as an obligation than a true word of thanks. Others were personal and heartfelt. These spoke not so much of the gift, but of the love behind it and the relationship involved. These more personal notes were the notes I treasured. All of us appreciate a word of thanks and appreciation. People who are often overlooked for thanks are ministers' wives and spouses. The minister gets the pat on the back and the word of encouragement after the sermon or musical special while his wife is in the background (usually chasing the kids). My words may not be contained in a beautiful note card, but they are especially for you, precious ministers' wife. Thank you for loving and supporting your spouse and being there for him to depend on. Your home is a haven where he can relax, refresh and find strength for the demanding job of ministry. Thank you for loving the Lord and using your unique talents to bless others. You often serve in your workplace, as well as your church. Ministry can mean giving up your job and moving on to new opportunities. Thank you for being willing. So many have been touched by your words of encouragement, comfort and concern as you pray and hold the hands of church members in homes, hospitals and hallways. Just being there and being willing to listen is a great gift. Thank you for being patient and understanding (at least most of the time) when church members need your husband's attention. Emergencies seem to always come at dinnertime or holidays don't they? Thank you for ignoring the negative, and concentrating on the positive. Your attitudes and actions have such a powerful influence on your husband, your children and your congregation. Church members, is there a minister's wife you know who could use a word of thanks? Look for ways to let her know she is a blessing to you and to your church. Believe me, those few words will be greatly treasured. Donna Vernon is married to Steve Vernon, Associate Executive for Texas Baptists. 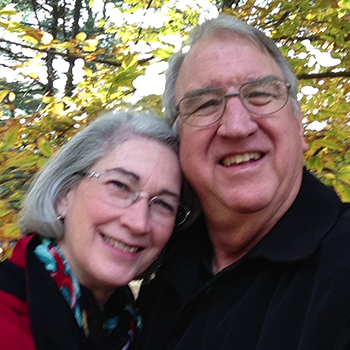 She was a pastor's wife for 32 years before moving to Dallas to begin denominational life. She also taught English for 23 years. Donna and Steve have 3 children and 5 wonderful grandchildren.